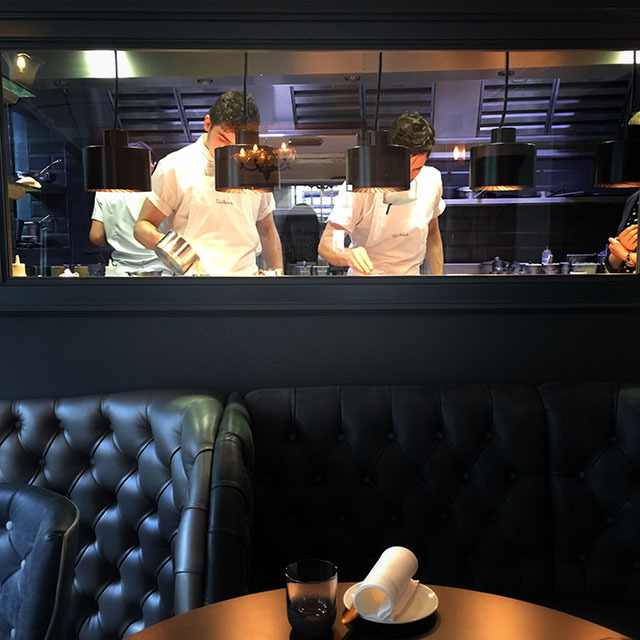 Following an extensive refurb in January and February, the interior oozes quality; hats off to Paul and his team for achieving such a top notch transformation in such a short space of time. There’s statement wallpaper (Cole and Son’s Miami in the private dining room looks fabulous), rich grey paintwork, a lot of sumptuous leather, bespoke furniture and lighting, and original artwork adorns the walls. The smart building now houses the luxurious Cici’s Bar upstairs; it’s the perfect place to sit with a glass of fizz whilst trying to decide what to choose from the mouthwatering menu. We opted for the set lunch menu, an absolute snip at £26 for three courses. Once settled at our table (in front of the window looking into the shiny new kitchen) we were presented with a bowl of crisp-crusted super-soft sourdough and the prettiest array of dips. 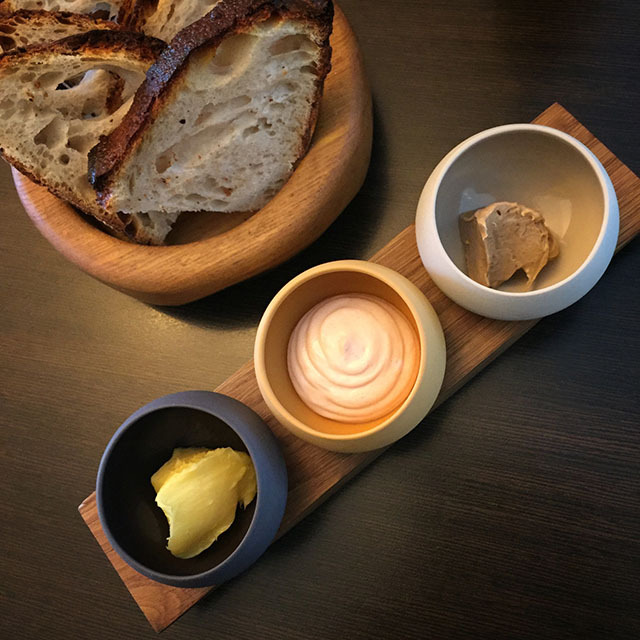 Dips, from left to right: über-salty whipped Jersey butter; whipped cod’s roe, the best taramasalata you’ll ever taste, especially when topped with pork crackling crumbs; caramelised butter, with the flavour of fudge and the texture of cream cheese, pure genius. The first course was simply described as “smoked haddock ~ vichyssoise ~ caviar chantilly”. 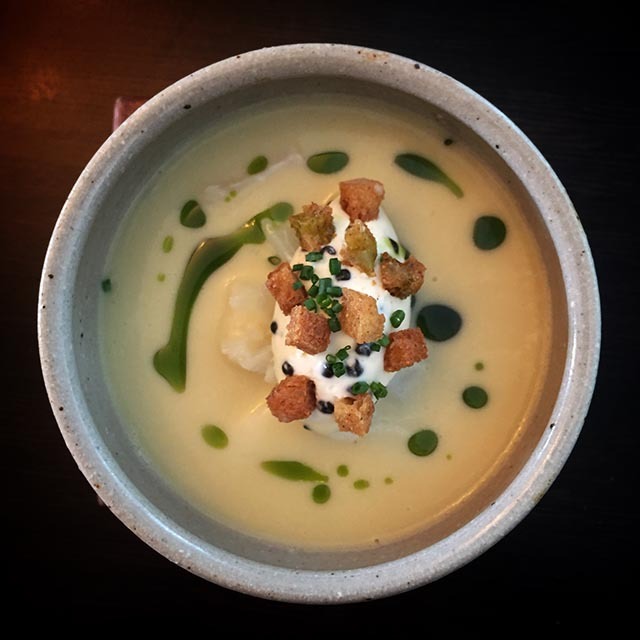 The dish was built at the table by the chefs, who poured hot vichyssoise around the generous portion of smoked haddock. This was topped with crème fraîche, croutons, chives and caviar, and a dash of wild garlic oil to finish. Smooth and creamy, rich and savoury, this was sublime. The main course was a juicy, tender chunk of hogget (meat from a sheep between one and two years old, i.e. halfway between lamb and mutton). The meat was rich and oh so flavoursome. 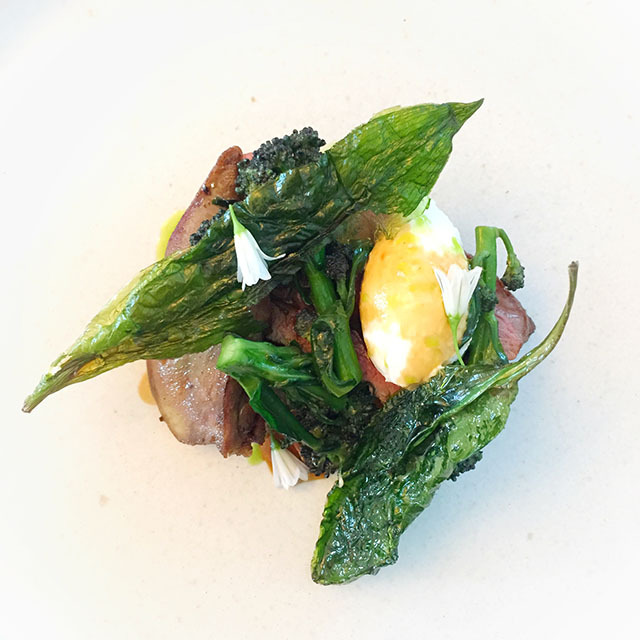 It was topped with a pan-fried slice of lamb’s tongue, purple sprouting broccoli (my favourite), deep-fried wild garlic leaves, wild garlic flowers and a quenelle of soft, light goat’s curd. Just remembering it is making my mouth water. At this point we were treated to an extra course. 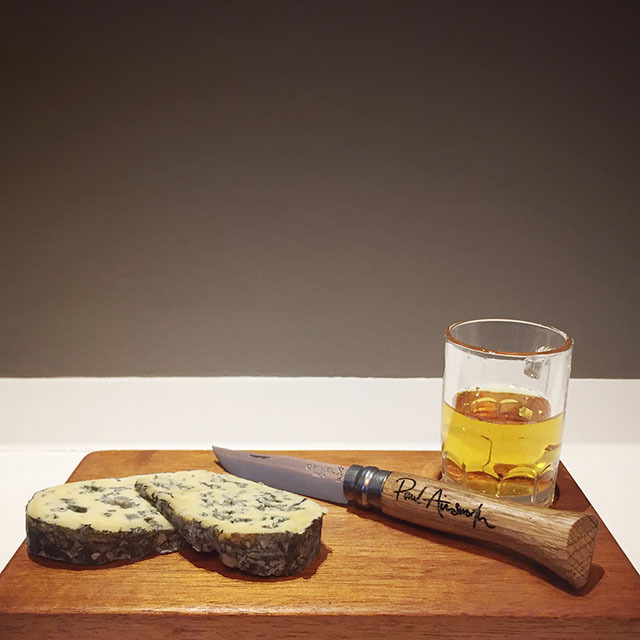 Two slices of the creamiest blue cheese (the award-winning Barkham Blue) were served on a gorgeous little board, with rather smart knives, and a glass of crisp Cornish cider. What I didn’t photograph is the accompanying mini hot apple tarte tatin, on crisp, puff pastry. Another perfect combination of flavours and textures. We returned to the set menu for dessert, simply entitled “rhubarb & apple ~ rolled oats ~ pistachio”. The flavours were fresh, just what we needed after the richness of the previous courses. 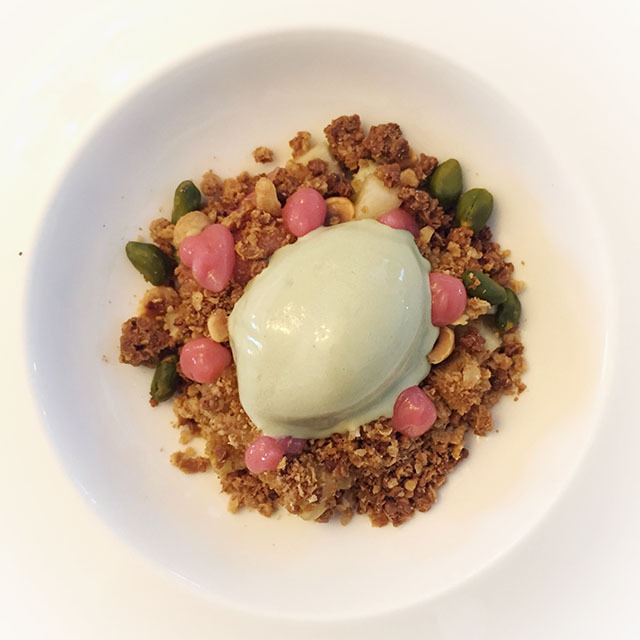 Chunks of soft, poached apple were topped with granola-esque oats, pistachios, bright pink rhubarb purée and pistachio ice cream. You think we stopped there? I’d spied a treasure chest across the restaurant, and needed to know what was in there, so we had a round of espressos/fresh mint tea. To my delight we were offered a selection of chocolates from the aforementioned chest. 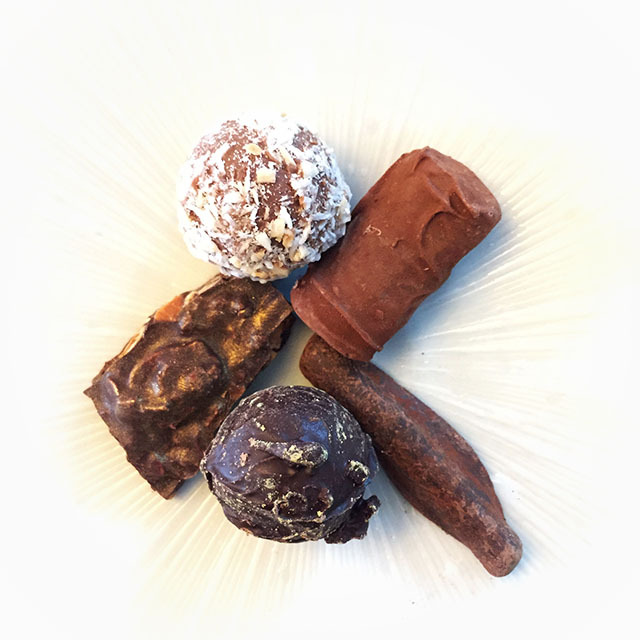 Dark chocolate coated chunks of candied orange peel, dark chocolate and mint truffles, salted caramel truffles, almond brittle, mini shortbread biscuits… The perfect end to a wonderful meal. We were very well looked after at No 6 – thank you to all the team for such generous hospitality. For more information, including menus and online reservations, visit the No 6 website. Paul Ainsworth also runs Rojano’s in the Square (best pizza in town) and in 2016 opened Padstow Townhouse, a smart B&B just around the corner from No 6. *Apologies for any inaccuracies in reporting our food – I obviously wasn’t taking notes or, it seems, concentrating properly when our dishes were explained. **I would like to think that the restaurant is on its way to earning a second Michelin star. Fingers crossed. Disclosure: the restaurant kindly gave us Champagne upon arrival, and the cheese course. We paid for the set menu and other drinks.